I’ll go ahead and say it – I’m highly disappointed by the Anya Hindmarch Cooper Mirror Bottom Bag. Mostly that’s my own fault, though. 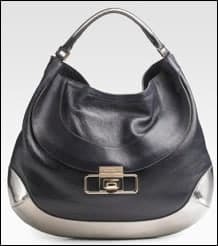 When I went to its Saks.com page, I thought it said COPPER Mirror Bottom Bag, and I had high hopes that the bottom piece of the bag was going to actually be made out of a piece of metal, and that would have been awesome. I had no idea that I had any desire for a bag made partly out of sheet metal until I realized that I had never seen one before, and then Anya Hindmarch seemed like a genius. But then I looked again and realized that, hey, it’s kind of a cool bag anyway. They shape is perfect – structured enough to have really clean lines, but still with enough slouch to have the appeal of a hobo. The leather appears to be really thick, the patent on the bottom is probably shiny enough to be used as a mirror, and the interior is lined in delicious cream suede. So many designers cut corners these days, and it looks like Ms. Hindmarch is still make beautiful, discrete, high-quality bags out of obviously fine materials. As such, she deserves our heartfelt appreciation, even if the bag is not actually part metal. Buy through Saks for $1,195. 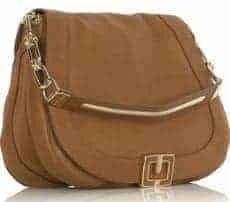 I tend to be attracted to large slouchy bags. I suppose with my height and style they are perfect. But I do realize that I need a few more everyday structured bags. Ok really, that is just an excuse to buy more bags, but I am ok with it. 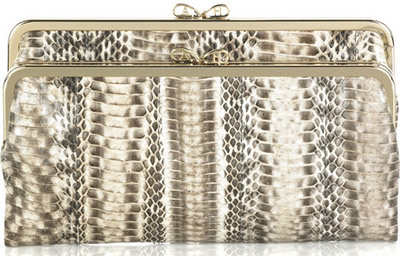 I am really drawn to the Anya Hindmarch Bess Shoulder Bag which sports a retro-style and a gold chain strap. The color of the leather is perfect, a rich creamy camel color on supple calf leather, which is offset by gold hardware. The shape is perfect, it provides structure but a casual-chic appeal which can easily be dressed up or dressed down. The chain strap has a leather top with metallic detail at the center. The handbag is finished off with a fold-over flap and magnetic closure. Buy through Net A Porter for $1,200.